Sometimes an artist comes along who is a perfect match for the larger, tropical outdoor setting of our neighbouring Botanic Gardens, and we call these once-a-year special events ‘Music Botanica’. 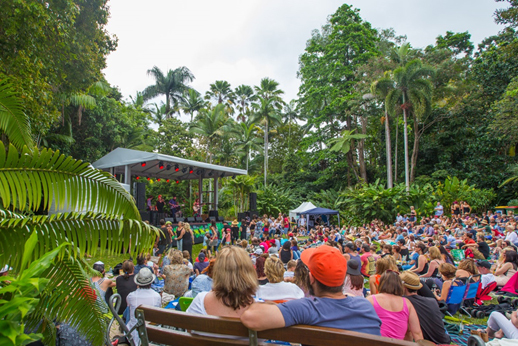 The Waifs, Missy Higgins, Geoffrey "Gurrumul" Yunipingu, Angus and Julia Stone and Sarah Blasko, are just some of the acts that have graced the open-sided stage, framed by the lush, towering tangle of tropical foliage in the Flecker Botanic Garden at sunset. Pack your picnic and a rug and arrive early to secure your position on the grassy hill. Music Botanica is a unique outdoor musical experience, proudly presented by Tanks Arts Centre and the Cairns Botanic Gardens.